"He's an amateur crank." It was Paul Samuelson talking, professor of economics at the Massachusetts Institute of Technology and winner of the noble prize. He was talking to Mike Wallace on "60 Minutes" about a self taught San Francisco economist who wants to make every American worker a capitalist: Louis Kelso. Kelso had been swimming upstream in the rarefied world of economics for nearly 20 years or so when some journalists and politicians began to listen and found he had something to say. According to Kelso, "America's official policy is to have a 'full employment' economy." "This is irrational when technology and automation are destroying jobs faster than new ones can be created." "What we need to do is develop a way for the workers to own 'a share of the action' - a share of the machines that actually produce the wealth." He points out that only about 6 per cent of the U.S. population derives a significant portion of its income from capital. The rest of the people must rely entirely on wages, salaries and commissions. No job, no money. What if most of the workers also owned some of the capital and began to derive a healthy portion of their income from this source, he asks. In time, he says, the boom-and-bust cycle, wild stock speculation and the wage-and-price spiral of inflation would be a thing of the past. If, instead of turning to traditional sources for this capital, a company created instead an Employee Stock Ownership Plan for its workers, that "ESOP" could go to the bank, borrow the money to buy the new stock of the company, and pay it back out of dividends from the stock. After all, he says, industry now pays off its capital borrowings out of profits. As soon as the loan was paid (typically in three to five years), the workers could begin to get their own dividends. And. it wouldn't cost them a cent out-of-pocket to become shareholders. Nor would it require present shareholders to give up any ownership. No "redistribution" scheme. All the while, industry would have its fresh capital at a cost less then it now pays. That' Kelso's plan in brief. There's more to it, of course. Sen. Russell Long, D- La., chairman of the Senate Finance Committee, is seriously interested in Kelso's visionary solutions to some of our economic problems, and the energetic Kelso (who has put a version of his plan to work in several score private firms) is beginning to get a full hearing for his idea in Washington. Those ideas may not be perfect, but they offer some real hope that the fraternity of ruling economists -captivates of Keynesian orthodoxy who have held sway for four decades-may be near the end of the road. Kelso's challenges to debate Samuelson (or any other orthodox economists) have gone unchallenged. But no wonder Mr. Samuelson was so tight-lipped when he dismissed Kelso out-of-hand on the television program. Kelso after all wasn't anointed to the economic high priesthood. Neither was Louis Pasteur. "More than 100 years ago, Abe Lincoln signed the Homestead Act making it possible for our people to own land. This was a revolutionary development. Ownership of land in most of the world had not been possible for the ordinary citizen.... The Homestead Act set the pattern for American capitalism.... Now we need an Industrial Homestead Act, and that isn't impossible." Radio commentary, "Tax Plan No. 1," /Viewpoint with Ronald Reagan/, February 1975. "We who live in free market societies believe that growth, prosperity and ultimately human fulfillment, are created from the bottom up, not the government down. Only when the human spirit is allowed to invent and create, only when individuals are given a personal stake in deciding economic policies and benefiting from their success — only then can societies remain economically alive, dynamic, progressive, and free. Trust the people. This is the one irrefutable lesson of the entire postwar period contradicting the notion that rigid government controls are essential to economic development." "I will tell you whatever you do don't risk having to face your children or your children's children some day when they ask "Where were you and what where you doing on that day Freedom was lost." Posted at AIPnews by Guy C. Stevenson. 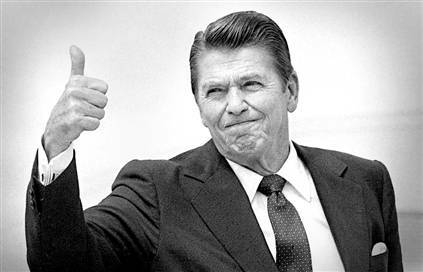 While Ronald Reagan definitely supported the ideas of Louis Kelso in his early political years, once he was elected to President he abandoned talking about these ideas for broadening personal OWNERSHIP of wealth-creating, income-producing capital assets simultaneously with the growth of the economy. We can only assume that the ideas were squelched by his conventional economic advisors, handlers, and the moneyed interests behind-the-scenes of his presidency. Instead of the question being "Did Ronald Reagan support Louis Kelso and 'Expanded Capital Ownership for all citizens?," the question should be how and where do we fine a true leader in today's world that will embrace and advocate for policies to transform us to an OWNERSHIP society where EVERY child, woman, and man can become an OWNER of wealth-creating, income-producing capital growth?